Haze, the oft-delayed shooter with a brain from Free Radical Design, has got a new release date and an announced demo on PSN. 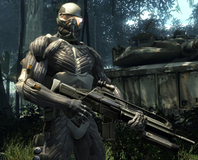 Haze, the long-delayed PlayStation 3 shooter from Free Radical Design, has been confirmed as a PS3 exclusive. Forever. Rob Yescombe, games writer for Free Radical Design and the mind behind the upcoming Haze, takes the microphone in a new guest column. He asks, just why is it that there are no good TV shows about games and whether this could change any time soon? We got a chance to go hands-on with Haze in an exclusive at Free Radical Design's HQ. Now we're finally able to spill the beans on the first must-have title for PlayStation 3.